Summary: The Catfish and Dogfish were BR�s standard small ballast hopper wagons, almost 2000 being built. Fitted with vacuum brakes from new, many lasted into the 1990s while a programme to fit air-brakes to surviving Dogfish wagons was started in 2000. Despite this, the last examples of both types were withdrawn in 2006. History: After building several designs of small ballast hoppers in its early years, BR settled on the 19-ton �Catfish� and 24-ton �Dogfish� from 1955 onwards. First on the scene was a batch of Catfish built by Metro-Cammell to lot number 2682. These are sometimes quoted as being built in 1953 but this is probably the lot issue date, with actual construction taking place in 1955. Built to diagram 1/586, the Catfish had a shallow but fairly conventional looking hopper with a single chute discharging between the rails. At one end of the 14ft wheelbase wagon was a platform with a single door control wheel, the vacuum cylinder being mounted at the opposite end. A further 5 lots were built over the next 6 years, all by Metro-Cammell and all to the same diagram number. Despite this, it is believed that the specification was changed at some point, later deliveries having roller bearings (instead of plain) and Oleo buffers (instead of the self-contained type). Wagons that were overhauled or repaired would also have been upgraded in the same way. Livery was initially black this later being changed to olive drab and finally grey with a yellow top band. Under TOPS these wagons were coded ZEV-A with design codes ZE500A-C being issued to cover minor differences. The Dogfish was a few inches taller than the Catfish and first appeared in 1956 (some sources give the date as 1959). The other main difference was that three unloading chutes were provided instead of just one, giving the ability to discharge between the rails or to either side. As a result of this the end platform featured three control wheels. Ten lots were eventually issued covering the construction of 1249 wagons, the first 7 being split between Metro-Cammell and Charles Roberts & Co. The final three lots were built at BR Shildon. As with the Catfish, a single diagram number (1/587) was issued which appears to ignore developments in terms of bearings and buffers. An additional diagram (1/588) was however issued to cover the conversion of 221 wagons to carry slag ballast. This material is less dense than normal ballast and the modifications entailed extending the sides and ends upwards to provide more volume capacity. The extentions were built on top of the existing hopper capping and always had a temporary look about them. One other variation that does not appear to have been distinguished is the fitting of extended hopper chutes to various Dogfish allocated to the Southern Region. These allowed ballast to be discharged beyond the third rail. Some of the Dogfish on the Southern were renamed with a new fishkind name of 'Mer-Dog' due to their use in conjunction with Mermaid side-tipping ballast wagons. The Dogfish fleet became ZFV-As under TOPS with a variety of design codes starting from ZF501A. Livery details were the same as for the ZEVs. Apart from the aforementioned, these wagons underwent very few changes during their long careers. Starting in about 1989 a handful of Dogfish were given through air pipes, resulting a new TOPS code of ZFW-A. Also in 1989, a single ZEV Catfish was modified by havings its hopper chutes removed and a fixed wooden floor fitted in the base of the hopper. This was planned to be the first of up to 200 for use as general spoil wagons in much the same way as the similarly converted Tope (ex coal hopper) wagons. The prototype was painted with the hopper sides in yellow upon which was painted, in very large letters, the new fishkind name of Puffin. Commentators at the time did not miss the fact that Puffins eat fish rather than �are� fish! 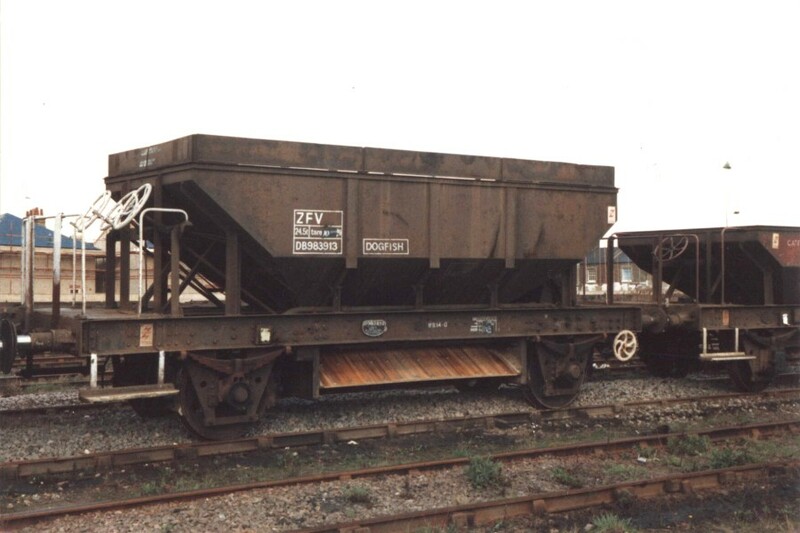 TOPS code of ZCV-N and design code ZC008A were allocated but the wagon ended up at Bescot depot being used as a mobile rubbish bin. This is apt, as the shape of the Catfish hopper, especially when painted yellow, does rather resemble the road skips that serve the same purpose. It is thought that no further conversions were undertaken. In the early 1990s at least four Catfish were recoded ZSV (design codes ZS152A/B) for reasons unknown. The ZSx code covers types such as crane runners, match wagons and brake force vehicles. By 1999 there were still 289 ZEVs, 762 ZFVs and 13 ZFWs listed on TOPS. The Catfish were all either withdrawn or in �no maintenance� pool use whereas the Dogfish were still mainly in regular use. Most were still in engineer's grey/yellow (or older) livery but at least a handful were repainted. Some had all grey hoppers (these may have been Transrail examples), while Loadhaul painted at least one black with the sloping hopper ends in orange. The fleet's vacuum brakes were by now of course a handicap rather than a benefit, as most train services (and indeed locomotives) were only able to take air-braked wagons. As such it was decided to convert some of the Dogfish to air brakes. Wagons started being sent to Wabtec at Doncaster in late 2000, an initial batch of 50 wagons having been authorised. Curiously, the TOPS code of HPA was issued for these conversions, even though the wagons were intended to resume their ballast-carrying duties. There are two possible explanations for this. Firstly, the distinction between �revenue� and �departmental� had lost a lot of meaning following the privatisation of BR. Departmental trains were now run by a �supplier� (EWS) for a �customer� (Railtrack), and the coding of other recent wagon builds and conversions reflected this. Secondly, the code ZFA was already in use for the large fleet of Gunnell, ex-PGA ballast hoppers. Rather confusingly, the HPAs retained their existing numbers but with the DB prefix deleted. This effectively put them in the air-braked series but luckily did not result in any duplication. There is no mention of any livery modifications or repaints to the conversions. In 2001 the numbers in stock (excluding HPAs) had dropped to 63 ZEV (all stored) and 444 ZFV/W (over 300 of which were non-operational). A second batch of 50 HPA conversions was reportedly authorised but it is thought that these did not took place. As it turned out, the HPAs lasted little longer than the ZFVs and all had been removed from TOPS by early 2008 with the exception of 4 long-term stored ZFVs. A large number survive in preservation. 05/04/2008: Improved details and photo of extended height Dogfish added. ZEV Catfish DB993660 at Kingswear, 28th June 2007. ZFV Dogfish DB983187 at Meldon, 2nd April 2005. ZFV Dogfish DB983913 at Willesden, March 1987. Note extended hopper, and compare with Catfish to right. Page added: 31/03/2008 Spotted an error? Got some additional info?